Although the Rio Grande is the major river in the Taos valley, nearly all domestic water use relies on groundwater aquifers. 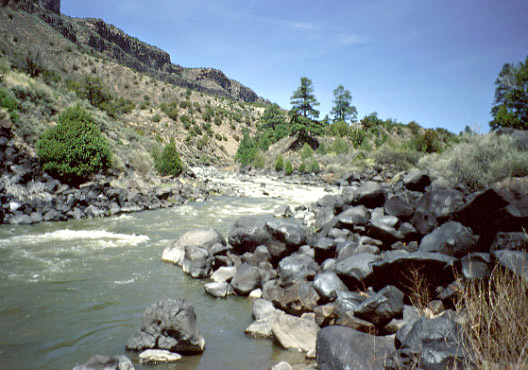 The river is generally inaccessible as it lies at the bottom of the deep Rio Grande gorge. Given the spatially complex distribution of coalescing Quaternary and Tertiary alluvial and volcanic rocks adjacent to the basin margin and the combined influence of complex faulting, ground-water flow paths along the southern edge of the Taos Valley are probably also quite complex. Mapping ground water at the basin margin is an important step toward more quantitative efforts to model ground-water flow in the basin. A potentiometric surface map, which depicts the altitude, slope and shape of the groundwater surface was developed for much of the area in which the Astronaut candidate gravity survey was conducted (see colored contour lines on geologic map). When interpreted in a geologic framework, the potentiometric surface map helps define groundwater flow direction, geologic controls on groundwater flow (structural, stratigraphic, or depositional), and areas receiving or lacking active recharge. Along the southern margin of the Taos Valley, the hydraulic gradient (change in hydraulic head over distance) in the bedrock aquifers along the mountain front generally follows topography, sloping downward from the mountains toward the basin. Groundwater flow direction (perpendicular to the isopotential lines) is northwest at a moderate to high gradient. Dramatic changes in this hydraulic gradient are a response to changes in the hydraulic conductivity of the water-bearing rocks making up the area's aquifers. The most dramatic gradient anomaly occurs along the Rio Grande del Rancho, between Arroyo Miranda and Rio Chiquito where the hydraulic gradient flattens to approximately 0.1. This lower gradient indicates a zone of relatively high hydraulic conductivity and increased groundwater flow in the region bounded by the Miranda and Rio Grande del Rancho faults. This increase in groundwater flow is an expected response to pervasive fault-related fracturing in the well-indurated Pennsylvanian sandstones and limestones and crystalline Proterozoic granite. The basin-margin faults also control groundwater movement across the basin margin. Major fault strands of the Embudo fault zone include broad, clay-rich, gouge zones that reduce permeability perpendicular to the fault. In general, water level and water quality data indicate that the Embudo fault zone impedes but does not prevent the flow of ground water across the fault and into the basin. The area between the Miranda fault and the Rio Grande del Rancho fault is the most significant recharge window along this portion of the basin margin. Both mountain stream-channel recharge and subsurface inflow across the Embudo fault are highly active mechanisms in this area, and together must contribute volumetrically significant amounts of ground water to the shallow alluvial aquifer and potentially to the deeper alluvial system in the Taos Valley. The Rio Fernando, like the Rio Grande del Rancho, is also a significant source of mountain stream-channel recharge, and may potentially contribute subsurface flow. Additional geologic and geophysical data are required to more fully evaluate the east-west faults in the Rio Fernando canyon and assess their potential for providing a significant pathway for subsurface flow across the margin. (Also see a technical report regarding the Hydrogeology of the Taos valley by Bauer et al, 1999).